On Saturday, March 2, 2019, the Bellamy Mansion Museum held its first Mardi Gras Casino Night. With a crowd of over 78 guests in addition to the staff and reporters from Stars News and Salt Magazine, the historic house was brimming with merriment and mirth. The house and its courtyard were themed for the occasion: lights of purple and green illuminated the night, string lights and a warm fire pit transformed the courtyard into a cozy square, each room of the first and second floors of the house were fitted with entertainment, and beads were strung everywhere. The Bellamy had pulled out all the stops. Each ticket to the event included game chips, raffle tickets, complimentary drink tickets, food, beads, and a night of fun. There were casino games from roulette and blackjack to poker and craps, live music by Sylvia Ritchie, hors d’oeuvres, signature cocktails, bourbon tasting courtesy of Heaven Hill, exciting raffle prizes, and a wine pull. The raffle included prizes such as tickets to Orlando Seaworld and Busch Gardens, a staycation at a downtown B&B with Rx dinner, a $200 bottle of bourbon courtesy of Heaven Hill, and so much more. For the event, the Bellamy had food catered by Diamond Food Enterprises. The staff of the community-oriented catering company was cordial and courteous throughout the evening, attending to the culinary needs of the guests and serving flavorful hors d’oeuvres. Served were dishes like jambalaya, pasta alfredo, cocktail shrimp, banana rum pudding, and sausage bites. The signature cocktail of the evening, provided by one of the event’s sponsors, Tito’s Handmade Vodka, was The Big Easy—a transformative drink made with Tito’s vodka, key lime juice, Sprite, and “magic blue ice” made with butterfly pea flower. When added to the drink, the blue ice causes the drink to gradually change colors from clear to purple. This is because the butterfly pea flower reacts to the pH level of the liquid it comes in contact with, such as turning purple in the presence of the citric acid found in key lime juice and Sprite. The drink was a popular choice among the guests for its magical quality and taste. The night was enjoyable even for the Bellamy staff working the event. For the first part of the night, I worked the registration table with the Event Coordinator, Carolyn Gonzalez. I got to see every guest that arrived in their lovely festive attire. The catering staff graciously offered us hors d’oeuvres while we worked, and the food tasted even better than it looked. Once all the guests were checked in, I wandered through the house to watch the guests’ revelry, try the different foods available, and help wherever needed. Although I was there to help host the event, I could not help but fall under the spell of Mardi Gras, enjoying the event throughout the evening. The proceeds from the event went towards the Bellamy Museum’s free community programming, such as lectures, workshops, art exhibits, Family Fun Day, Nights of Lights, and scholarships to the museum summer camp. As a night of great fun that contributed to programs that benefit the Wilmington community, it was certainly not an event to be missed. Disclaimer: Casino gaming tables were provided for entertainment purposes only. No prizes were awarded for table winnings. Son of Englishman Alexander Gould and enslaved Wilmington woman Elizabeth Moore, William B. Gould I is known for his plasterwork at the Bellamy mansion, his subsequent escape from slavery, and his service in the US Navy. As an enslaved worker for Nicholas Nixon, Gould learned the trade of plasterwork and also learned to read and write despite laws prohibiting slaves from doing so. On September 21, 1862, Gould escaped with other slaves during one of Wilmington’s yellow fever epidemics. They rowed down the Cape Fear River and boarded a Union vessel named the U.S.S. Cambridge. Within days of this escape, Gould began recording his life in a diary, one that was later lost to the family and discovered by William B. Gould III in 1958. Decades later, William B. Gould IV published these memoirs under the name Diary of a Contraband: The Civil War Passage of a Black Sailor. Gould I joined the US Navy and served with them during the Civil War. 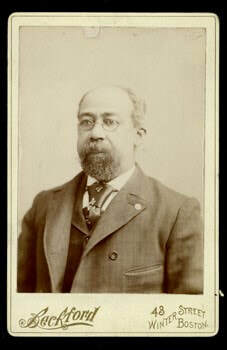 After the war’s end, Gould I married Cornelia Read, a freed black woman also from Wilmington and moved to Massachusetts, where he settled down with his wife and family and continued working in the plastering trade, as well as becoming an important local figure in and around Dedham until his death in 1923. 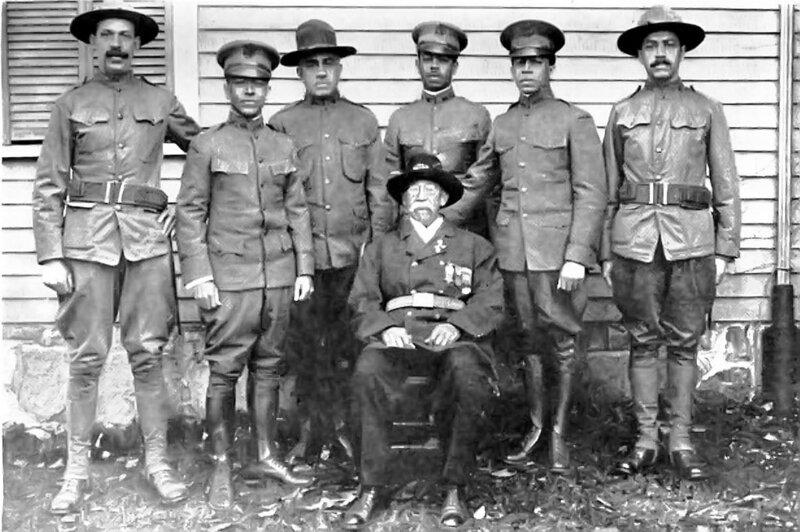 His six sons followed in their father’s footsteps and served in the military; all served in World War I, except for his oldest son who served in the Spanish-American War. The connection between Gould I and the Bellamy mansion was not tangibly established until 1995 when the staff of the Bellamy Mansion Museum found a section of molded plaster during renovations that had the initials “WBG” inscribed on the back. This allowed historians to connect Gould with the intricate craftsmanship that was done on the house’s plaster, giving him due credit for his work. Bishir, Catherine W. The Bellamy Mansion. Raleigh, Historic Preservation Foundation of North Carolina, 2004. Print. ——. “Gould, William B. I (1837-1923).” North Carolina Architects and Builders, NCSU Libraries, 2015. Web. Accessed 19 Nov 2018. http://ncarchitects.lib.ncsu.edu/people/P000320. The Christmas season brings with it traditions that have often been celebrated for generations. Many traditions such as trimming the tree and caroling originated in the 19th-century. For Ellen Bellamy, she recalled 19th-century Christmas celebrations at “Uncle Taylor’s” house, where a feast was planned for over two dozen people and, "the table extended from the front windows to the back. They prepared for this dinner for weeks.” Ellen remembered being amazed by “a pyramid of glass which extended up to the top of the ceiling and was decorated with flowers and fruit.” It is thanks to Ellen’s recollections that we know what the holidays were like for the Bellamys and their prominent extended family. However, what was Christmas like for their enslaved workers? While we have no documentary evidence of what Christmas was like for the men, women, and children enslaved at the Bellamy mansion, there is written evidence of what enslaved people throughout the antebellum South and here in North Carolina experienced during the holidays. Slave-owners were often more lenient and generous with their enslaved workers around the holidays, such as in the number of passes they gave out to their slaves. These passes allowed enslaved individuals to travel off their owner’s property and into town or to other nearby plantations, which allowed them to visit friends or relatives on nearby plantations. Without a pass, enslaved workers risked the chance of getting caught by patrols and being whipped. Since there was more travel happening around the end of the year, “planters were usually more liberal in issuing passes during the Christmas season“ (Wiggins 206). However, during this time the amount of nighttime patrols were increased to capture runaways. In Southern cities, contracts for work began on or around January 1st for enslaved individuals. Christmas was a time when they could be with their loved ones before being hired out for months or even the entire year to another family or business. Sometimes the enslaved worker was contracted to someone in another city or even another state. Slave-owners gave these incentives in order to quell any thoughts of slave rebellions or escape during the holidays. Enslaved worker Henry Bibb recalled making plans to run away at the end of the year, but before he could act on his plans, Bibb’s master gave him the option to get married. Bibb remained and the marriage festivities consumed his time, as he says “Our Christmas holidays were spent in matrimonial visiting among our friends, while it should have been spent in running away to Canada” (Bigham). "Plantation Frolic On Christmas Eve." Library of Congress. Other “traditions” that occurred around the Christmas season were those of slave-owners giving small gifts and feasts to their enslaved workers. Slave-owners filled up enslaved children’s stockings on Christmas day with small knickknacks like fruit and nuts, and Christmas was when enslaved individuals received their one pair of shoes for the year. As Emma Blalock recalled in Slave Narratives: A Folk History in the United States from Interviews with Former Slaves, “We had plenty homespun dresses and we got shoes once a year, at Christmas Eve. I ken ‘member it just as good. We got Christmas Holidays an’ a stocking full of candy an’ peanuts. Sometimes we got ginger snaps at Christmas. My grandmother cooked them.” Slave-owners giving gifts to their enslaved workers was a way to show to the world how affluent a family was. This was especially seen during the Civil War when “consumer shortages threatened to interrupt their performance. Slave-owners desperately sought even the paltriest gifts for slaves, knowing that their pretensions of power hinged in part on their being able to repeat past gift-giving” (Bigham). In addition, the Christmas season was a time when slave-owners gave special food and alcohol to their enslaved workers in celebration. Food and alcohol that was given, though not all together at once, included turkey, pigs, sweets, nuts, rabbits that they were given permission to catch, whiskey, eggnog, brandy, cedar, wine or beer. With these feasts, “whole hogs, sheep, or beeves were cooked and the slaves ate peach cobbler and apple dumplings, and frequently got drunk.” (Blassingame 107). However, there were former slaves who reported that their owners never gave them time off for Christmas or New Year’s. As Charity McAllister says in Slave Narratives, “Dey did not give us any holidays Christmas in Harnett County. Dat was ‘gisnt de rules.” While some reports say that most slaves were given anywhere from a day up to a week of time off during the holidays, this was not a guarantee, especially in the case of slaves on plantations or slave-owners punishing slaves for misbehavior earlier in the year. The entirety of the holiday experience was based upon the master and what they deemed appropriate. 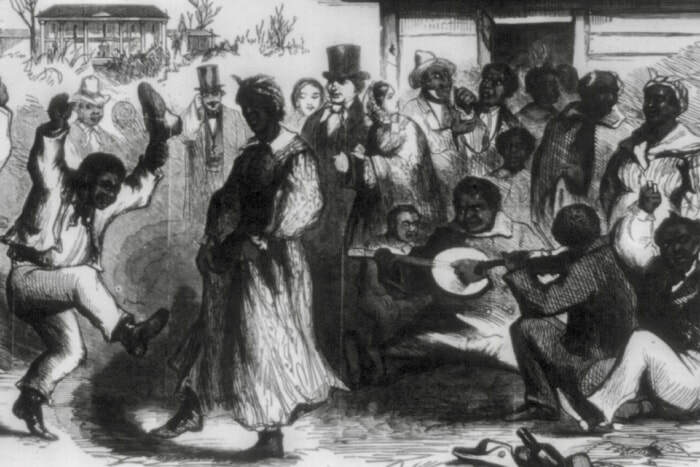 For some slave-owners, the enslaved worker’s celebrations during Christmas were seen as entertaining, such as their dancing, and often slave-owners had the workers sing or play the fiddle for them on Christmas day. While the holiday experiences of enslaved workers at the Bellamy mansion are unknown, at the Bellamy Mansion Museum visitors can experience the fully decorated mansion as well visit the decorated original slaves quarters. 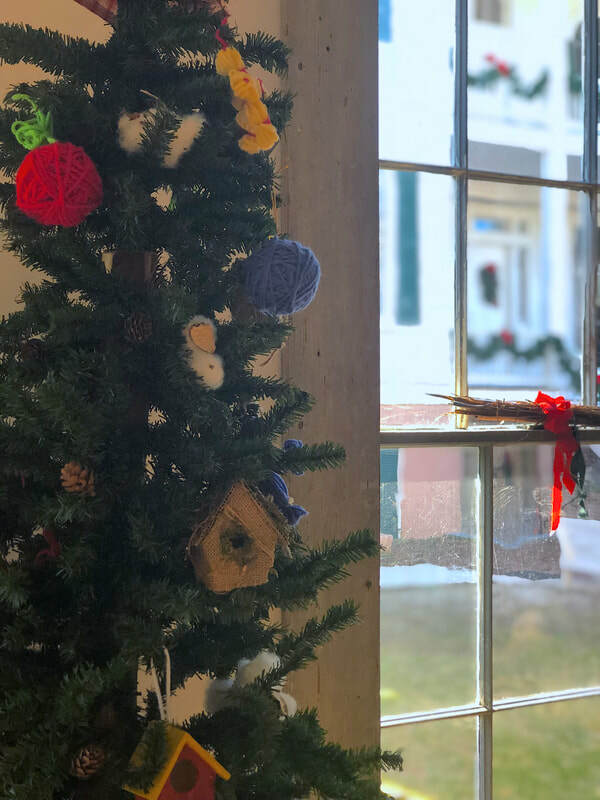 The decorations in the slave quarters are designed according to the research mentioned in this article, as well as other research on the experience of enslaved workers during the holiday season throughout North Carolina. Special thanks to former Bellamy Mansion intern Alyson Mayernik for her research on this topic, which was used in the writing of this article. -Bigham, Shauna, and Robert E. May. "The Time o' all Times? Masters, Slaves, and Christmas in the Old South." Journal of the Early Republic 18, no. 2 (Summer, 1998): 263-288. https://search- proquest-com.liblink.uncw.edu/docview/220950705?accountid=14606. -Blassingame, John W. The Slave Community: Plantation Life in the Antebellum South. Oxford: Oxford University Press, 1940. -“Born in Slavery: Slave Narratives from the Federal Writers' Project, 1936 to 1938.” Library of Congress, online collection. Accessed 12 Nov. 2018. Web. -Wiggins, D. “Good Times on the Old Plantation: Popular Recreations of the Black Slave in Antebellum South, 1810-1860.” Journal of Sports History 4. Fall 1997. 260-284. When the Bellamy’s left their newly built house on Market Street in 1862 to escape the Civil War and Yellow Fever epidemic, little did they know that they would not officially return for over two years, in the fall of 1865. After leaving Wilmington, the Bellamy’s lost their house due to the Confiscation Act of July 17, 1862, which “authorized in rem procedures against the property of Southern rebels and their sympathizers” and “stated that the properties seized were to be used for supporting the Union cause in waging its war” (Kochan). It was thanks to Dr. Bellamy’s efforts after the war to obtain a presidential pardon from President Johnson that the family regained their property and house. Yet, what did it take to get his pardon after the war? The troubles that the Bellamy’s went through are in part due to the reconstruction efforts of President Andrew Johnson. Johnson was caught between the two sides that had appeared due to the war--the union supporters and the Secessionists. He himself was a Democrat from Tennessee, and in his government positions, “generally adhered to the dominant Democratic views favoring lower tariffs and opposing antislavery agitation” (“Andrew Johnson”). Yet, after Lincon’s election in 1860, Johnson broke away from the Democratic party when he voiced his dissent against Southern secession. When Lincoln eventually selected Johnson to run as his Vice President in 1864, it was merely to gain the support of “loyal ‘war’ Democrats” (“Andrew Johnson”). No one thought that he would be anything other than Vice President of the United States. But then Lincoln was assassinated, and suddenly Johnson found himself president of a divided nation that needed to rebuild itself, with a Congress intent on doing what it determined was best for reconstruction, no matter what the new president thought. However, there was one power that President Johnson had, which he used as an attempt to pull the country back together: presidential pardons. These pardons were an attempt to bring the secessionists back into the Union, while also appeasing the Republicans who called for even harsher punishment. Johnson’s pardon gave clemency to many white Southerners, excepting those who fell under one of the fourteen exceptions listed in his Amnesty Proclamation decreed on May 29th, 1865. In addition, the pardon restored all property (except former slaves) and rights of a US Citizen to the former Confederates. As for the pardon process itself, it involved a number of steps before an individual could obtain one. Johnson first “pardoned all who would take an oath of allegiance, but required leaders and men of wealth to obtain special Presidential pardons” (“Andrew Johson” whitehouse.gov). These leaders and men of wealth had to make a trip to Washington D.C. or send a representative in their stead. However, it is possible that these individuals were more successful if they appeared themselves to request a personal pardon from President Johnson (“Restoring the Union”). These men were additionally required to also swear an oath of allegiance to the Union and promise to uphold the 13th amendment which abolished slavery. "Andrew Johnson.” Encyclopedia Britannica, 12 Oct. 2018, https://www.britannica.com/biography/Andrew-Johnson. Foner, Eric. “Reconstruction.” Encyclopedia Britannica, 5 Jan. 2018, https://www.britannica.com/event/Reconstruction-United-States-history#ref226039. Kochan, Donald J. “B. The Confiscation Act of 1862 and Civil War Forfeitures.” Mackinac Center for Public Policy, 1 July 1998, https://www.mackinac.org/1278. “President Johnson's Amnesty Proclamation. ; Restoration to Rights of Property Except in Slaves. An Oath of Loyalty as a Condition Precedent. Legality of Confiscation Proceedings Recognized. Exception of Certain Offenders from this Amnesty. By These Special Applications for Pardon May be Made. Reorganization in North Carolina. Appointment of a Provisional Governor. A State Covention to be Chosen by Loyal Citizens. The Machinery of the Federal Government to be Putin Operation. AMNESTY PROCLAMATION.” The New York Times, https://www.nytimes.com/1865/05/30/archives/president-johnsons-amnesty-proclamation-restoration-to-rights-of.html. “Restoring the Union.” Lumen Learning (OER Services), https://courses.lumenlearning.com/suny-ushistory2os2xmaster/chapter/restoring-the-union/. Need a new shirt? You can go to any of a hundred different stores in modern Wilmington or even simply buy on online and have it shipped right to your door. But in the mid-1800’s, getting some new threads was not as easy as it is today, even for a wealthy family like the Bellamys. Though we do not know much about the clothing that the Bellamy family wore, we can use written historical records and resources to gain a better understanding of how they acquired the clothing they did have. First up is the foundation of any piece of clothing, historic or modern- the material. The Bellamy family had their own source for cotton and wool as they owned a plantation in Brunswick County. Ellen Douglas Bellamy, the youngest daughter of John and Eliza Bellamy, mentioned these resources in her memoir Back With The Tide. “We had provisions of all kinds, raising cotton, spinning and weaving our cloth, both cotton and wool, for we had a large flock of sheep,” (p. 14) at Grovely Plantation where John Bellamy kept 82 enslaved workers who did the “raising,” the “spinning,” and the “weaving.” While cotton is the crop most people associate with the antebellum South, plantations in the Wilmington area, like Grovely, mainly grew food products like peanuts, rice, and corn, as well as raising livestock. Cotton and other materials brought in through Wilmington’s busy port were often in the form of already woven fabrics or finished clothing ready for purchase, ranging from rough textiles like “gunny cloth” to refined French cashmere. “One of our women, Mozella, was such an expert spinner that her yarns were too fine and even for our looms. Mother took me with her to Drs. Drew’s, a first rate weaver, file miles from us, and got her to weave a bolt of beautiful white flannel from Mozella’s yarn. It was used then, and long afterwards, for skirts for all our family and kin [...]. We tanned the leather and made our shoes. Richmond, one of our slaves, cut his knee and thus was disabled for doing accustomed work of cutting wood; so Pa apprenticed him for a time to a Mr. Hewett, a shoemaker in Wilmington, and Richmond became quite an expert. His shoes would bear inspection by the most fastidious. My sister would make the uppers of little shoes from old pants or scraps of heavy cloth for my baby brother, and Richmond would sole them” (p. 14). Ellen Douglass Bellamy, circa 1860. The inhabitants of the Bellamy Mansion and its longest resident, Ellen Bellamy (1852-1946), witnessed many changes in fashion and the production of it during their lives. With the introduction of the Singer sewing machine in 1851, the production of garments became much easier. While there are no records of the Bellamy household owning a sewing machine, the Singer sewing machine did have a presence in Wilmington, judging by this ad from 1859. Singer sewing machine ad from The Wilmington Daily Herald, published Friday, July 15th, 1859. As the Bellamys were wealthy and could afford it, their dresses were often made with numerous folds, full floor-length skirts, and miles upon miles of ruffles. This is evident in the pictures of the Bellamy family which display the family’s fashion choices. Two women, identities unknown but most likely Bellamy family or relatives. 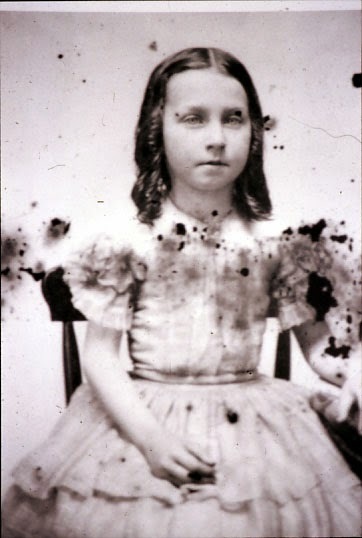 Mary Elizabeth "Belle" Bellamy, circa 1860. One part of 19th century fashion the Bellamy women embraced was that of lace collars, as seen in the picture of Mary Elizabeth “Belle” Bellamy above. As with other fashion production in the mid-1800s, the manufacturing of lace became more mechanized in order to produce enough to fulfill demands, but some lace was also still handmade, mostly through methods of bobbins, tatting, or crochet. Accent pieces that used lace were usually in the form of detachable collars that laid over the dress neckline and cuffs that were either detachable or sewn onto the end of sleeves (Origins of Lace). While there are no clear records of lace use or production in the Bellamy household, it is safe to assume that it existed, especially since we have photos of family members wearing lace collars as seen in this article. There are also contemporary records of lace and lace collars being sold by merchants in Wilmington, ads touting both “real” and “imitation” laces, meaning handmade and machine-made lace respectively (Origins of Lace). Ad published in The Wilmington Daily Herald on Tuesday, October 11th, 1859. Ad published in The Tri Weekly Commercial on Saturday, September 16th, 1854. The culture of fashion and textiles in America changed rapidly throughout the lifetime of the Bellamy family, heralding the beginning of the clothing industry we are familiar with today. While some of the fashion of the era may seem old and antiquated, there are parts of it that survive in our style even today and connect us to the past. Written by Bellamy Mansion intern and UNCW English Major Caitlyn Dark. Bates, Christopher G. “The Early Republic and Antebellum America: An Encyclopedia of Social, Political, Cultural, and Economic History.” First edition, Routledge, 2015. Bellamy, Ellen Douglass. “Back With The Tide.” Edited by Janet K. Speaker, Reprint edition, Bellamy Mansion Museum of History and Design Arts, 2002. Gerard, Philip. “A House Divided.” Our State Magazine, Our State Magazine, 28 April 2011, https://www.ourstate.com/bellamy-mansion/. “Ladies' Antebellum Clothing - Fabrics.” Historic Northampton Museum and Education Center, 2018, historic-northampton.org/virtual_exhibits/antebellum/fabrics.html. “The Origins & History of Lace.” The Lace Guild, 2017, https://www.laceguild.org/craft/index.html. Ghosts at the Bellamy Mansion? Elegant Antebellum architecture, grand wrap-around porches, rich cultural history, and . . . lively ghosts from long ago? Not something usually associated with the Bellamy Mansion Museum, yet stories from visitors, guests, and part-time employees beg to differ. Even featured in books such as Ghosts of Old Wilmington by John Hirchak and Haunted Wilmington by Brooks Newton Preik—from which the following stories come—the Mansion has had visitors reporting that they saw something supernatural. Perhaps, though, these stories are similar to the skeleton that William “Willie” Bellamy once placed around the house to scare others; spooky and unnerving, but ultimately just entertaining tales that connect us to the past. Of all the mansion's many floors, it is the top floor, the Children's Floor, that gives guests the uneasiest feelings. Visitors say that they feel uncomfortable or even ill upon reaching the top floor. Many have no wishes to linger any longer than necessary. In addition, it is from the top floor that guests “find themselves mysteriously drawn into the Belvedere atop the house,” or even the feeling of something, or someone, “urging them up into the Belvedere” (Hirchak). However, it should not be forgotten that the top level contains the bedrooms of the youngest Bellamy children. As it was a private space where guests would not roam, the top floor was designed with dark grain wood floors and walls and was more sparsely decorated. In addition, it is more of an enclosed space with limited natural light due to the fact that it is located in the roof of the mansion. These characteristics are likely what lend the “creepy” feeling that some guests and visitors experience, as not everyone is okay with small and dimly lit locations. Actually, the top floor was once the happiest floor in the mansion according to the memories of Ellen Douglas Bellamy, who lived in the home until her death in 1946. The Bellamy children spent a great deal of time there, playing games and putting on plays performed upon the storage platform they turned into a stage. It was not a dark or spooky place to avoid back in 1861, rather it was likely the brightest and happiest place in the whole mansion. Perhaps the eeriest stories involve the member of the Bellamy family who lived in the house longer than all others—Ellen Douglas Bellamy. As one story goes, as an elderly woman, Ellen would often read the newspaper before bed, and the black ink would rub off onto her fingers. When she turned off the wall sconce, the ink was transferred onto the wall, and over time this residue built up. Nothing unusual, except for the fact that it is said one can still see the smudge marks reappear near the sconce today, even after multiple repaintings of the room. This story holds some truth, as Ellen Bellamy was a well-read and educated woman. She loved to read the newspaper, especially in her later years when Ellen’s health kept her mainly in her bedroom. It was in this southwest bedroom that Ellen wrote her book, Back With the Tide, recalling her earliest memories from when the family first moved into the mansion, their evacuation to Floral College at the start of the Civil War, and the subsequent return to their home. As for the ink smudges? The mansion’s bedroom level is comprised entirely of white walls. 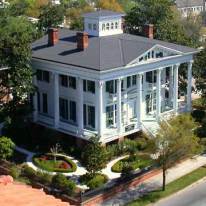 With the many visitors that the Bellamy Mansion has—adults, teens, and young children—all exploring the house on a guided tour with a docent or on a self-guided audio tour, it would not be remiss to say that some guests may be seeing the fingerprints of previous visitors who strayed too close to the white walls. 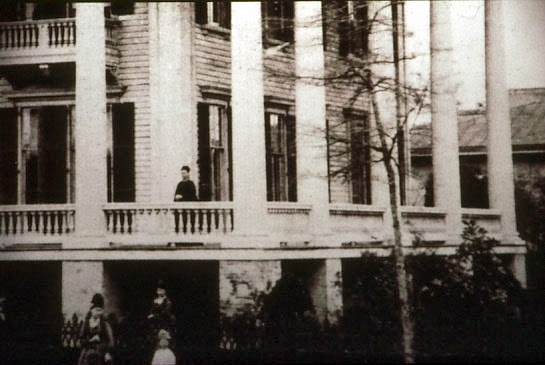 Bellamy family members posing for the first photograph taken of the mansion in 1873. Maybe one of the most well-documented paranormal incidents occurred in 1990 while filming was taking place in the mansion. The film crew was in the Library, and the report goes, "We had locked the door behind us and were completely alone in the house when suddenly we heard the heavy front door open and slam shut with a loud bang. A cold blast of air rushed through the closed door up the stairs and into the Library . . . our papers sailed in every direction. Within seconds, we were out of there . . . we heard the Library door slam shut . . . followed by an angry pounding on [the door]" (Roberts). It is possible to debunk part of the story. With the mansion's design, was the gust of wind simply from a difference in pressure created by other doors or windows being open, or even the wind coming from one of those openings? Was the film crew truly alone, or did an employee enter the house through the front door unseen? And, in their haste to flee the room, perhaps the pounding they heard was from something else entirely? 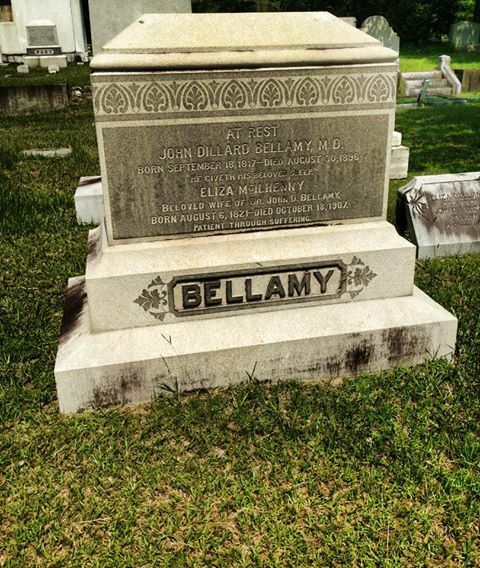 John and Eliza Bellamy's gravestone in the Bellamy family plot at Oakdale Cemetery. 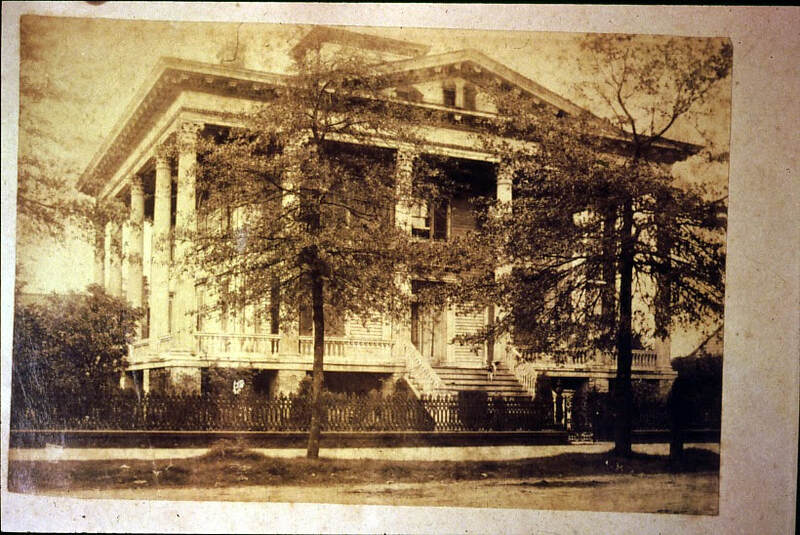 In the end, is the Bellamy Mansion truly haunted by spirits of the past, or are the stories simply products of active imaginations set free in the 157-year-old antebellum house? It seems that you’ll have to visit the Bellamy Mansion Museum to judge for yourself. Hirchak, John. Ghosts of Old Wilmington. Charleston, Haunted America, 2006. Print. Preik, Brooks Newton. Haunted Wilmington. Wilmington, Stuart House Publications, 1995. Print. Roberts, Nancy. Ghosts from the Coast. Chapel Hill, The University of North Carolina Press, 2001. Print. ​In September, Hurricane Florence descended on North Carolina’s southeastern shore. The storm battered the Wilmington area including the historic downtown. The Bellamy Mansion Museum was one of the many historical homes that sustained significant damage. The mansion’s roof, which had just been through repairs two weeks before the hurricane, suffered the most damage. A large portion of the roof peeled away during the height of the storm, allowing rain to pour into all five levels of the mansion. The water soaked into the plaster walls and caused extensive damage, softening the plaster and producing conditions ripe for mold growth. The water also soaked into the plaster’s wood lathe structure, causing the wood to swell and the subsequent movement to shift and crack the plaster. 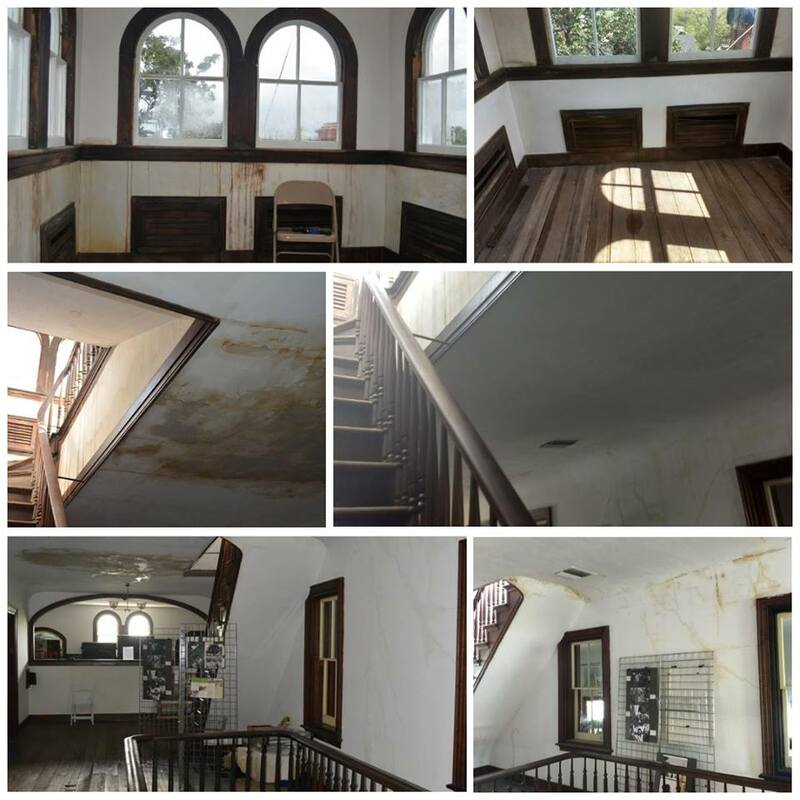 The water damage extended through all five floors of the historic home with most of the water ending up pooling on the mansion’s carpets and wooden floors. The wood floors began to curl up due to water and the carpets were soaked. Other parts of the mansion grounds also sustained some damage, though not as extensive as the main house. The most obvious damage was in the gardens where the 148-year-old heritage magnolia trees lost large portions of their top canopies, but all five weathered the storm relatively well. ​The museum was closed for sixteen days after the hurricane. During this time, the museum experienced an estimated revenue loss of $18,000-$20,000, counting lost admission fees, two canceled weddings, and the cancellation of the final Jazz at the Museum concert. Restoration efforts are underway at the Bellamy Mansion Museum thanks to continued volunteer efforts and the skills of local restoration experts. The wood floors, carpets, and plaster are now dry and mold free. Roofing work, plaster repair, and painting are all ongoing. Currently the damage is estimated at around $40,000, but that figure is expected to rise as work continues. Due to the museum’s high insurance deductible of $272,000, most of the repairs will be paid for directly by the museum. The Bellamy Mansion Museum appreciates the continued support of community members, local businesses, and other organizations. The museum has been open since September 27th and welcomes people to come see the restoration process in action. If you would like to support the Bellamy Mansion Museum in the wake of Hurricane Florence, there are several ways you can help. Once way is to donate by mail, phone, or online at www.bellamymansion.org/donate. Another way to is to join the museum as a member of Friends of the Bellamy Mansion, where membership fees help fund the museum and the various free events hosted by the mansion. Finally, you can help by spreading word that the museum is open and come visit us yourself! Some of the upcoming events at the Bellamy Mansion Museum include the Jingle Belles Holiday Tea and the Christmas Stroll Through the Past. If you’d like to learn more about these events and more, please visit www.bellamymansion.org/upcoming-events. It was March 31, 1952, when Emmett Hargrove Bellamy and his assistant, Lloyd S. Elkins, boarded the seventh-floor elevator of the Charlotte Law Building in Charlotte, North Carolina. Suddenly, a gunman, later identified as Albert Raymond Reinhart, 50, stormed the elevator and opened fire using a .38 caliber revolver. Elkins was injured in the shooting, but Bellamy was killed from a gunshot wound to the stomach. Bellamy was 61 years of age and Elkins, just 25. Emmett H. Bellamy was born in Wilmington on February 12, 1891, to John Dillard Bellamy, Jr. and Emma May Hargrove. Bellamy attended the University of North Carolina at Chapel Hill and received his law degree from Columbia University. Additionally, Bellamy served in the military during World War I and was honorably discharged with the rank of First Lieutenant. Upon his retirement from the military, Bellamy practiced with his father’s law firm, John D. Bellamy & Sons, based out of Wilmington. In addition to his work as a lawyer, Bellamy was a prominent political figure in North Carolina. The Democratic lawyer was elected to the North Carolina House of Representatives in 1921 and to the Senate in 1923. 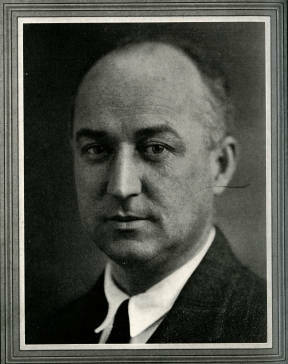 Bellamy also served as a delegate to the Democratic National Convention from 1940 to 1944. At the time of his murder, Bellamy had retired from politics and was practicing law in Charlotte. During police questioning, Bellamy's murderer, Albert Reinhart, was quoted as saying he was “incensed” at Bellamy over the handling of his case. Reinhart, a hotel owner from Myrtle Beach, South Carolina, traveled to Charlotte to "show down" with Bellamy regarding the real estate deal in which he believed Bellamy had "taken advantage of" his elderly mother. During the preliminary hearing, Reinhart made an insanity plea, but was ruled sane enough to stand trial upon examination by two Duke University doctors. In addition to a murder charge against him, Bellamy's assistant who was wounded in the shooting, filed a $100,000 damage suit against Reinhart. Reinhart was eventually found guilty of first-degree murder and was sentenced to life in prison. Emmett Bellamy is buried alongside his wife, Lillian Frances Maxwell, in Oakdale Cemetery in Wilmington, North Carolina. ​When people tour the Bellamy Mansion, one of the first things they notice when they enter the house is the elaborate plaster moldings in the more public parts of the house. The house, designed with Greek Revival and Italianate styling, was the product of the hard work and labor of both enslaved skilled carpenters, and local, freed black artisans. The skilled and unskilled enslaved workers in Wilmington were hired out and whatever wages they earned were given directly back to their masters. Unfortunately, we do not know the names of all of the black artisans who worked on the house. We do, however, know a great deal about one of these men thanks to his journal and the extensive work of his great-grandson, William B.
William B. Gould was born November 18th, 1837, to an English man and a slave woman in Wilmington, North Carolina. He was owned by Nicholas Nixon, who was a successful peanut planter and prominent member of the Wilmington Community. Around 1859, Gould began his work as plasterer and mason under the employment of Dr. John D. Bellamy for the construction of the Bellamy Mansion. Alongside other slaves and freeman, Gould created beautiful works of art within the molding of the house. It was common practice for those who hired out slaves to clothe, feed, and shelter them for their duration of their work. 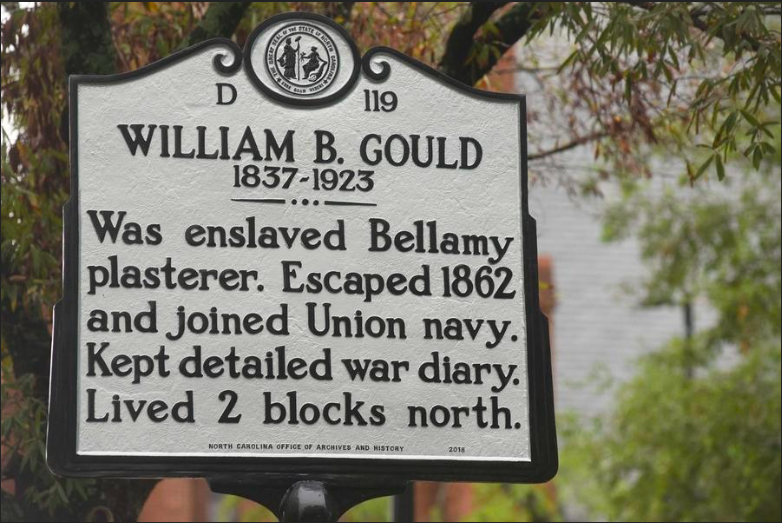 So, it is more than likely that Gould resided in the slave quarters during his time at the Bellamy Mansion. As a credit to his hard work, Gould signed his name into the plaster of the house; forever cementing his place in the Bellamy Mansion’s history (pictured above). This is incredibly significant, because following a series of laws passed in 1830 it was declared illegal to teach slaves how to read or write in the state of North Carolina. It is probable that Gould learned how to read through the church. Nixon was Episcopal and they were notorious for looking the other way when it came to slave literacy. Peter Hinks writes, "perhaps the most common avenue to literacy for blacks was instruction by a white person who considered it their religious duty to teach their slaves how to read Scripture (2). Christopher Hager supports this claim, saying, "many slaveholders wished to make exceptions [to slave literacy laws] for religious instruction (usually by white preachers)" (114). On September 21st, 1862, Gould, and seven other men, escaped off of Orange Street and into the Cape Fear River. Six days later they were picked up by The USS Cambridge and recorded as “contraband of war.” Gould began his three-year journal on September 27th, 1862, following his daily life in the United States Navy. After the Civil war he settled in Dedham, Massachusetts with his wife, Cornelia Read, and had eight children, six boys and two girls. He joined the Grand Army of the Republic in 1882 and held almost every position possible including the highest position, Commander. William B Gould IV, Gould’s great-grandson, wrote a book that includes Gould’s journals called Diary of a Contraband: The Civil War Passage of a Black Sailor. In this book he writes about the history surrounding his great-grandfather’s life and discusses the chronology of Gould’s diary. Gould IV, William B. Diary of a Contraband: The Civil War Passage of a Black Sailor. Standford University Press, 2002. Hinks, Peter P. To awaken my afflicted brethren: David Walker and the problem of antebellum slave resistance. Penn State Press, 2010. Volunteer Spotlight: the Rise and Shine Group! Angie (far right), with members of Rise and Shine. With over 200 volunteers, the Bellamy Mansion Museum is able to operate daily. From conducting tours to working the cash register, the work the volunteers do at the Bellamy cannot be understated. This month, we're shining the light on Angie Yelverton. Angie, along with her Rise and Shine group, have been volunteering at the Bellamy for 5 years. On the first Monday of each month, Angie and her crew make their way to the Bellamy and give it a cleaning from the inside out. Earlier this month, Angie spoke out about about her mission here at the Bellamy and what the Rise and Shine group has in store for the future. ​Angie, a Virginia native and Virginia Tech alum, has been living in Wilmington for roughly 33 years. Angie says her desire to volunteer at the Bellamy Mansion arose when she kept driving by the home everyday, not knowing much about it, but wanting to get involved somehow. Angie's idea to create a volunteer group to clean the mansion came about when she spotted some dust on a banister as she was helping take town Christmas decorations, following the Bellamy's annual Christmas Stroll. And thus, the Rise and Shine group was born. From roughly 9AM until noon, the Rise and Shine group, normally consisting of 6 to 8 people, get right to work cleaning the mansion. Even with a decent sized group, the Bellamy is no quick, in-and-out cleaning job. According to Angie, the most difficult and time consuming sections of the mansion to clean are the downstairs and basement. Angie Yelverton, founder of the Rise and Shine group. As a former Forestry and Wildlife major, Angie has long had a passion and mission to preserve. Angie said the most rewarding part about volunteering at the Bellamy is being able to preserve and upkeep such a historic and beautiful place. 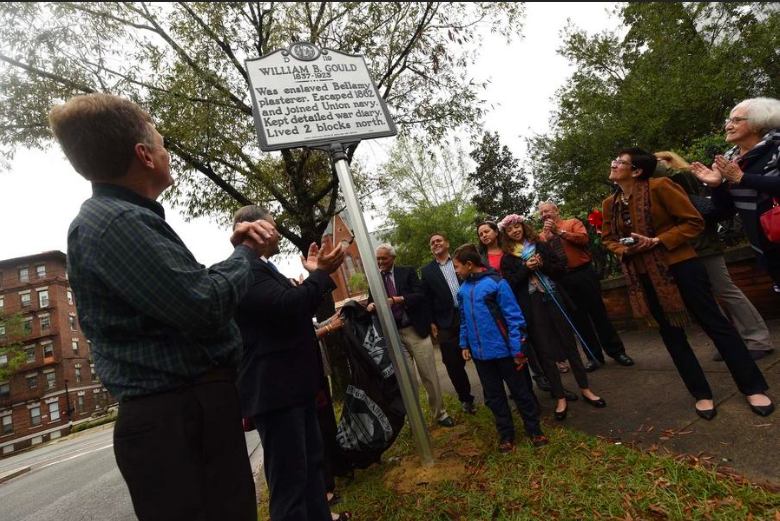 The Rise and Shine group takes pride in being able to play a role in preserving one of Wilmington's most storied and admired landmarks. That being said, when will the Rise and Shine group hang up their cleaning supplies and call it a day? "When I'm dead, I guess," Angie said with a laugh. As long as the Bellamy Mansion is standing, you can be sure the Rise and Shine group will be around to keep it looking brand new. ​The hard work our volunteers do here is always appreciated. If you'd like to join the volunteer team here at the Bellamy Mansion Museum, feel free to give us a call or visit our website: www.bellamymansion.org/volunteer-interest-form.html. Written by Bellamy intern and UNCW English major Sydney Simmons. The museum offers tours, features changing exhibits, and provides venue space for weddings and special events.